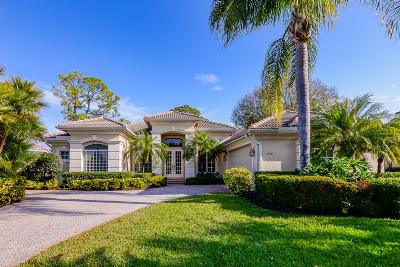 Lowest priced golf course pool home in Cypress Point on a quiet cul de sac overlooking the lake as well as the 14th and 15th fairways of the Ryder Golf Course. This home features a formal living room with sliders to the screen pool and patio as well as a family room with a wall of built ins and sliders to the patio. Large kitchen with lots of cabinets, a newer high end refrigerator, large snack bar plus a breakfast area overlooking the pool and golf course. Dining room will accommodate a large dining room set. Spacious den with wood floors. Master suite with tray ceilings, french doors to the patio, 2 walk in closets, double vanities, separate shower and a roman tub. Accordian shutters. Extra cabinets in the garage plus a paver driveway and walkway.